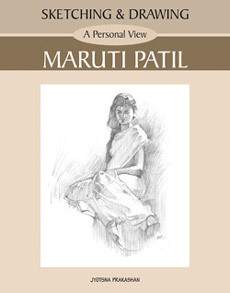 Senior artist Maruti Patil, after having many awards to his credit still loves sketching. Here he shares his thoughts and working methods of sketching and drawing the human figure, a subject most budding artists find challenging. It helps one to understand various ways of sketching like time-sketch, quick-sketch, etc. In addition, the artist shares some different ways of using pencil, pastels and bow-pen. His experience as a teacher for more than 40 years makes his advice useful for everyone who loves sketching and figure drawing.